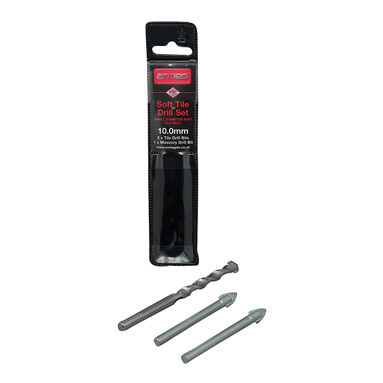 6mm ceramic tile drill bits x2 + 6mm masonry drill bit (for drilling fixing holes in substrate behind the tile). Ideal for drilling softer tiles such as ceramics & travertine. Tile bits are 'point ground' for added grip on start-up to reduce slippage and wander. 10mm drill bit pictured, 6mm will be supplied.